Robot Operating System (ROS) is robotics middleware (i.e. collection of software frameworks for robot software development). Although ROS is not an operating system, it provides services designed for a heterogeneous computer cluster such as hardware abstraction, low-level device control, implementation of commonly used functionality, message-passing between processes, and package management. Running sets of ROS-based processes are represented in a graph architecture where processing takes place in nodes that may receive, post and multiplex sensor, control, state, planning, actuator, and other messages. Despite the importance of reactivity and low latency in robot control, ROS itself is not a real-time OS (RTOS). It is possible, however, to integrate ROS with real-time code. The lack of support for real-time systems has been addressed in the creation of ROS 2.0.
packages containing application-related code which uses one or more ROS client libraries. Both the language-independent tools and the main client libraries (C++, Python, and Lisp) are released under the terms of the BSD license, and as such are open source software and free for both commercial and research use. The majority of other packages are licensed under a variety of open source licenses. These other packages implement commonly used functionality and applications such as hardware drivers, robot models, datatypes, planning, perception, simultaneous localization and mapping, simulation tools, and other algorithms. ROS was started by borrowing the best practices from many early open source robotic software frameworks including switchyard by the Stanford Artificial Intelligence Laboratory in support of the Stanford AI Robot STAIR (STanford AI Robot) project. Development was performed primarily at Willow Garage, a robotics research lab, when Eric Berger and Keenan Wyrobek, the founders of the Stanford Personal Robotics Program, left Stanford to start the Personal Robotics Program at Willow Garage. During that time, researchers at more than twenty institutions collaborated with Willow Garage engineers in a federated development model. February 2013, ROS stewardship transitioned to the Open Source Robotics Foundation. August 2013, a blog posting announced that Willow Garage would be absorbed by another company started by its founder, Suitable Technologies. 9/12–13/2014: ROSCon 2014 takes place in Chicago. Program here. 5/16/2017: Open Source Robotics Foundation changed its name to Open Robotics. 9/21/2017: ROSCon 2017. Program here. 9/29/2018: ROSCon 2018 in Madrid. 11/26/2018: Amazon launches AWS RoboMaker. The cloud-based service utilizes Robot Operating System (ROS) to offer developers a place to develop and test robotics applications. publishing or subscribing to data streams: images, stereo, laser, control, actuator, contact sensor, etc. ROS-Industrial is an open-source project (BSD (legacy) / Apache 2.0 (preferred) license) that extends the advanced capabilities of ROS to manufacturing automation and robotics. The ROS-Industrial repository includes interfaces for common industrial manipulators, grippers, sensors, and device networks. It also provides software libraries for automatic 2D/3D sensor calibration, process path/motion planning, applications like Scan-N-Plan, developer tools like the Qt Creator ROS Plugin, and training curriculum that is specific to the needs of manufacturers. ROS-I is supported by an international Consortium of industry and research members. The project began as a collaborative endeavor between Yaskawa Motoman Robotics, Southwest Research Institute, and Willow Garage to support the use of ROS for manufacturing automation, with the GitHub repository being founded in January 2012 by Shaun Edwards (SwRI). Currently, the Consortium is divided into three groups; the ROS-Industrial Consortium Americas (led by SwRI and located in San Antonio, Texas), the ROS-Industrial Consortium Europe (led by Fraunhofer IPA and located in Stuttgart, Germany) and the ROS-Industrial Consortium Asia Pacific (led by Advanced Remanufacturing and Technology Centre (ARTC) and Nanyang Technological University (NTU) and located in Singapore). The Consortia supports the global ROS-Industrial community by conducting ROS-I training, providing technical support and setting the future roadmap for ROS-I, as well as conducting pre-competitive joint industry projects to develop new ROS-I capabilities. Baxter at Rethink Robotics, Inc. Shadow Robot Hand – A fully dexterous humanoid hand. SummitXL: Mobile robot developed by Robotnik, an engineering company specialized in mobile robots, robotic arms, and industrial solutions with ROS architecture. UBR1 developed by Unbounded Robotics, a spin-off of Willow Garage. Webots: robot simulator integrating a complete ROS programming interface. ROS contains many open source implementations of common robotics functionality and algorithms. These open source implementations are organized into "packages". Many packages are included as part of ROS distributions, while others may be developed by individuals and distributed through code sharing sites such as github. ^ "ROS Melodic Morenia". wiki.ros.org. Retrieved 10 June 2018. ^ Kay, Jackie. "Proposal for Implementation of Real-time Systems in ROS 2". Retrieved 16 August 2016. ^ Kay, Jackie. "Realtime Design Guidelines For ROS 2". design.ROS2.org. ROS2. Retrieved 22 November 2018. ^ "ROS 2 For Realtime Applications". discourse.ROS.org. ROS. Retrieved 22 November 2018. ^ "Browsing packages for indigo". ROS.org. ROS. Retrieved 21 February 2016. ^ "Package Summary". ROS.org. ROS. Retrieved 21 February 2016. ^ "client libraries". ROS.org. Retrieved 12 December 2017. ^ "ROS/Installation - ROS Wiki". Wiki.ros.org. 29 September 2013. Retrieved 12 July 2014. ^ "android - ROS Wiki". Wiki.ros.org. 12 April 2014. Retrieved 12 July 2014. 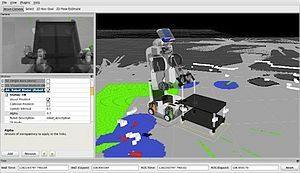 ^ "Robot Operating System (ROS) Support from MATLAB - Hardware Support". Mathworks.com. Retrieved 12 July 2014. ^ "STAIR". stair.Stanford.edu. Retrieved 12 December 2017. ^ "Repository: code". Sourceforge.net. Retrieved 12 December 2017. ^ "The Origin Story of ROS, the Linux of Robotics". IEEE Spectrum: Technology, Engineering, and Science News. Retrieved 31 October 2017. ^ "Stanford Personal Robotics Program". personalrobotics.stanford.edu. Retrieved 3 July 2017. ^ "Robot Operating System". EngineerJobs Magazine. 1 May 2013. Retrieved 3 July 2017. ^ "Repositories". ROS.org. Retrieved 7 June 2011. ^ a b Quigley, Morgan; Gerkey, Brian; Conley, Ken; Faust, Josh; Foote, Tully; Leibs, Jeremy; Berger, Eric; Wheeler, Rob; Ng, Andrew. "ROS: an open-source Robot Operating System" (PDF). Retrieved 3 April 2010. ^ "ROS robotics news: February 2009 Archives". www.ROS.org. Retrieved 12 December 2017. ^ "Welcome to ros.org - ROS robotics news". www.ROS.org. Retrieved 12 December 2017. ^ "ROS Tutorials and Turtles - ROS robotics news". www.ROS.org. Retrieved 12 December 2017. ^ "Robots Using ROS: Marvin autonomous car (Austin Robot Technology/UT Austin) - ROS robotics news". www.ROS.org. Retrieved 12 December 2017. ^ "Robots Using ROS: Penn Quadrotors - ROS robotics news". www.ROS.org. Retrieved 12 December 2017. ^ "Robots Using ROS: Lego NXT - ROS robotics news". www.ROS.org. Retrieved 12 December 2017. ^ "PR2 Robots Available for Purchase". ^ "Announcing ROS Answers - ROS robotics news". www.ROS.org. Retrieved 12 December 2017. ^ "ROS on the Move: TurtleBots available for preorder - Willow Garage". www.WillowGarage.com. Retrieved 12 December 2017. ^ "Google I/O 2011: Cloud Robotics, ROS for Java and Android - ROS robotics news". www.ros.org. Retrieved 24 November 2018. ^ "100 Repositories - ROS robotics news". www.ROS.org. Retrieved 12 December 2017. ^ "Celebrating the fourth anniversary of ROS... and the First ROSCon 2012 - ROS robotics news". www.ros.org. Retrieved 24 November 2018. ^ "Willow Garage Spins Out OSRF". ^ "DARPA Awards Simulation Software Contract to Open Source Robotics Foundation". ^ "Thanks for a great ROSCon 2012! - ROS robotics news". www.ros.org. Retrieved 24 November 2018. ^ "New Book: ROS by Example - ROS robotics news". www.ros.org. Retrieved 24 November 2018. ^ "Rethink ROS - ROS robotics news". www.ros.org. Retrieved 24 November 2018. ^ "ROS: Five Years - ROS robotics news". www.ros.org. Retrieved 24 November 2018. ^ "Osrf - Ros @ Osrf". Osrfoundation.org. 11 February 2013. Retrieved 12 July 2014. ^ "10,000 Questions Asked on ROS Answers". ^ "employees join Suitable Technologies". Willow Garage. Retrieved 12 July 2014. ^ "A new www.ros.org - ROS robotics news". www.ROS.org. Retrieved 12 December 2017. ^ "Clearpath Welcomes PR2 to the Family". ^ "ROS Answers Reaches 15,000 Questions". ^ "ROS running on ISS - ROS robotics news". www.ROS.org. Retrieved 12 December 2017. ^ "Program - ROSCon 2014". roscon.ROS.org. Retrieved 12 December 2017. ^ "ROS and Gazebo at DRC Finals". ^ "Report from first ROS Summer School in China - ROS robotics news". www.ros.org. Retrieved 24 November 2018. ^ "ROS Turns 8 - ROS robotics news". www.ROS.org. Retrieved 12 December 2017. ^ "Programming Robots with ROS: A Practical Introduction to the Robot Operating System". OReilly.com. Retrieved 12 December 2017. ^ "First Danish ROS Meetup". ^ "ROS Summer School in China 2016, July 22-28 - ROS robotics news". www.ros.org. Retrieved 24 November 2018. ^ "ROS Robot Ignite Academy". ^ "OSRF Collaboration with TRI". ^ "Bosch Underwrites Full-Time Position at OSRF". ^ "First Ukrainian ROS Meetup". ^ "Welcome to Open Robotics". www.OSRFoundation.org. Retrieved 12 December 2017. ^ "ROS Summer School in China, July 22-28, 2017". Discourse.ROS.org. Retrieved 12 December 2017. ^ "ROSCon 2017". roscon.ROS.org. Retrieved 12 December 2017. ^ "melodic - ROS Wiki". wiki.ros.org. Retrieved 28 May 2018. ^ "ROS-Industrial About". rosindustrial.org. Retrieved 12 December 2017. ^ "Brief History". ROS-Industrial. Retrieved 11 July 2018. ^ "Home". ROS-Industrial. Retrieved 12 December 2017. ^ "CMU Personal Robotics Lab". personalrobotics.Intel-Research.net. Retrieved 12 December 2017. ^ "Husky UGV - Outdoor Field Research Robot by Clearpath". ClearPathRobotics.com. Retrieved 12 December 2017. ^ "Stanford Personal Robotics Program". personalrobotics.Stanford.edu. Retrieved 12 December 2017. ^ B. Hannaford, J. Rosen, Diana CW Friedman, H. King, P. Roan, L. Cheng, D. Glozman, J. Ma, S.N. Kosari, L. White, 'Raven-II: AN Open Platform for Surgical Robotics Research,' IEEE Transactions on Biomedical Engineering, vol. 60, pp. 954-959, April 2013. ^ "BioRobotics Laboratory | Biorobotics Laboratory - University of Washington". Brl.ee.washington.edu. Retrieved 12 July 2014. ^ "Summit XL - Robotnik". Robotnik.es. Retrieved 12 July 2014. ^ "nao - ROS Wiki". Ros.org. 28 October 2013. Retrieved 12 July 2014. ^ "Specification". Unbounded Robotics. Retrieved 12 July 2014. ^ Ackerman, Evan (21 October 2013). "UBR-1 Robot From Unbounded Robotics Revolutionizes Affordable Mobile Manipulation - IEEE Spectrum". Spectrum.ieee.org. Retrieved 12 July 2014. ^ "Ubiquity Robotics Downloads". Retrieved 29 January 2018. ^ "ROSberryPi/Installing ROS Kinetic on the Raspberry Pi". Retrieved 29 January 2018. ^ "Using ROS with Webots". Retrieved 18 May 2018. STAIR: The STanford Artificial Intelligence Robot project, Andrew Y. Ng, Stephen Gould, Morgan Quigley, Ashutosh Saxena, Eric Berger. Snowbird, 2008. RT middleware – Robot middleware standard/implementations. RT-component is discussed / defined by the Object Management Group. This page was last edited on 10 April 2019, at 19:45 (UTC).